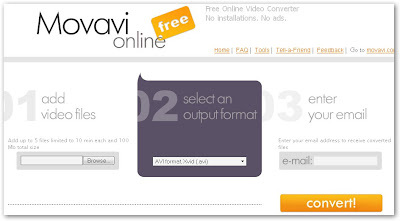 Movavi offers free online video conversion. It's like a more specialized Zamzar. The advantage of both sites is that you don't need to install any software to convert files. Converting a video is a three step process on Movavi. First, you can upload up to 5 files; each file limited to less than 10 minutes and 100 megabytes in size. Then, choose the output format (Flash video, MOV, MPEG, iPod, etc.). Finally, enter your email address to get a link to your converted video. Although the site is mainly set up to promote the paid software analogue to the online service, Movavi is still useful if for some reason you don't want to install any conversion software or can't reach an alternative online converter.